Threats against almost 50 people in north Belfast should be lifted immediately, a Sinn Féin MLA has said. 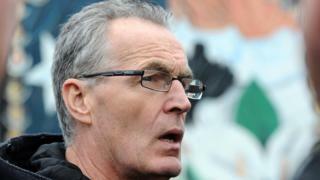 Gerry Kelly said a leaflet containing threats against 48 people had been circulating "in the public arena". The leaflet purports to be from a group calling itself "Communities Against Drugs", and it names people who should "come forward". "No one should be subject to these kind of threats in this day and age," said Mr Kelly. "These threats should be lifted immediately and those responsible need to stop these actions." The Greater Ardoyne Residents Association (GARC) said the leaflets were distributed immediately after a meeting it held to discuss "the ongoing scourge of drugs" in the area. However, it said it had played no part in the distribution of the leaflets. "It doesn't state the purpose of coming forward, whether that is to stop, get punished or pay up," said the group on its Facebook page. "It names a number of high-profile death dealers, while several others' involvement in drugs is doubtful. "It is our opinion that it was intended to cause confusion within the local community and attempt to dictate the pace of a viable, community response that will be public, structured and organised. "GARC, and those who last night committed themselves to establishing a project that will empower and campaign on behalf of residents, played no part in this leaflet." Police said they were investigating the distribution of written material in parts of north Belfast. "Circulating material such as this is intensely unhelpful and potentially dangerous," said Ch Insp Stephen Burns. "While we do not discuss the security of individuals, if we receive information that a person's life may be at risk we will inform them accordingly. "We never ignore anything which may put an individual at risk. "I also want to reassure the public that police are actively working with communities to address criminality and issues like drug dealing across all parts of Northern Ireland," he added.